Port Dauphin, a French village on Dauphin Island and port for Mobile (1702 to ca. 1725), has been the scene of recent excavations. The site lays protected under a thick layer of sand; we shoveled it aside, since mechanical equipment could have damaged the fragile site. Because this may be our only opportunity to excavate at Port Dauphin, we took great care to retrieve as much information as possible. The professional staff and field school students "piece-plotted" every major artifact -- that is, each potsherd and pipe stem fragment was left in place after its discovery so the exact locations could be precisely mapped. The resulting distribution maps indicate where particular activities of the colonists took place in relation to the architectural features. In the lower left photo, you can see Matthew Cooper digging inside the foundation trenches (white stains) of a small square room. 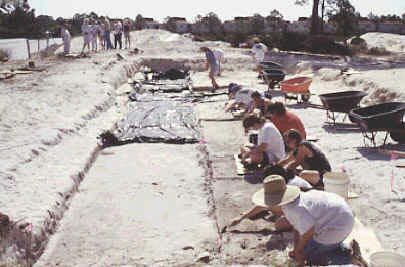 Hurricane Danny temporarily halted our excavations when it inundated the island with an estimated 42 inches of rain in July 1997. A hurricane in 1717 closed the entrance to the harbor, then located on the south side of the island, which eventually led to the abandonment of the village. Some surprisingly large artifacts were found at Port Dauphin. Contrary to popular belief, archaeologists seldom find treasure. Instead, we typically find peoples trash, things considered useless by their owners because they were either broken or obsolete. 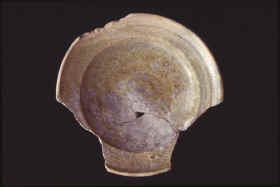 Consequently, most archaeological artifacts are quite small. Cushioned by the soft sand, however, some of the Port Dauphin artifacts have remained relatively intact, instead of being trampled to small fragments as were most of the broken Old Mobile artifacts. This nearly complete serving plate was made in France. Even more astonishing was the discovery of three intact English wine bottles. These had been placed, probably intentionally, upside down in the sand outside one of the doorways. We dont know why the colonists did this. 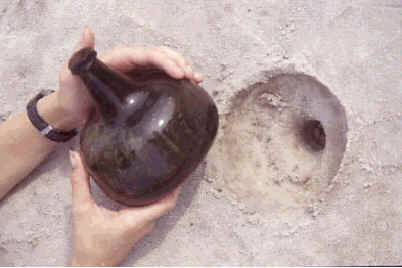 The abundance of wine glasses associated with the structure suggests that it may have functioned as a tavern, so perhaps the wine bottles were deposited by an inebriated patron. Many of the Port Dauphin artifacts came from England and Spain, not France, presumably because all sorts of ships stopped at Dauphin Island and their crews conducted some private trading with the enterprising islanders. 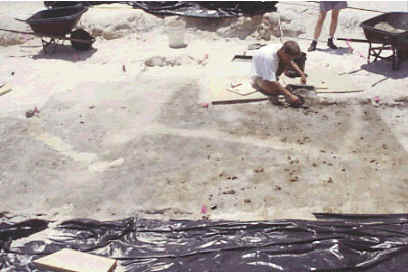 Archaeological excavations at Port Dauphin were made possible by a grant from the Alabama Historical Commission's Historic Preservation Trust Fund, and matching funds from the University of South Alabama.